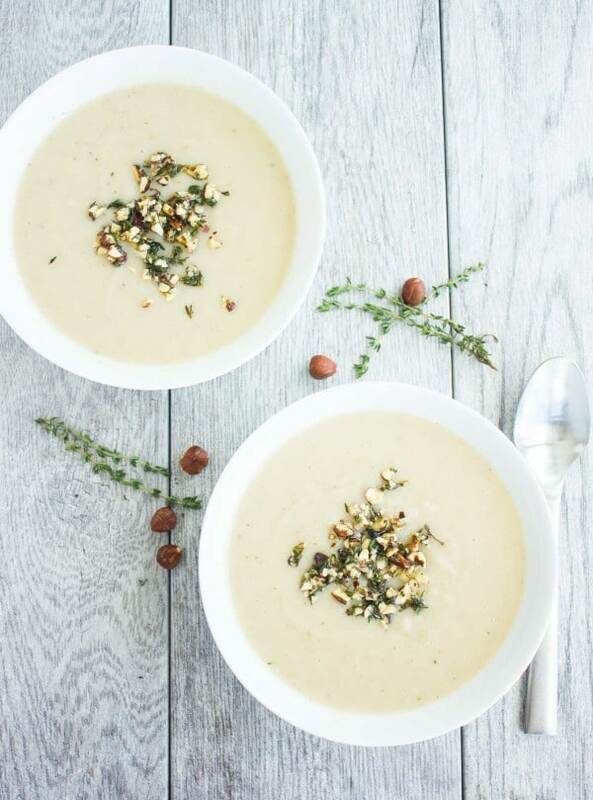 This vegan Cauliflower Hazelnut Pear Soup recipe is smooth, rich, satisfying and the perfect dish to cheer you up on a cold rainy day. Serve this creamy vegan soup with a Crunchy Thyme & Hazelnut Topping! This vegan Cauliflower Hazelnut Pear Soup recipe is smooth, rich, satisfying and the best thing to cheer you up on a cold rainy day. The best thing? Even Cauliflower-haters will love this creamy, rich soup because it really does not taste that much of cauliflower. Nevertheless, it gives this soup a smooth almost floral taste. The flavors are in complete harmony: Creamy cauliflower with a touch of sweetness from the pear paired with smooth nutty hazelnut. All seasoned with fresh thyme, thickened up with gluten-free oats and all blended together with broth and white navy beans for extra protein and richness. 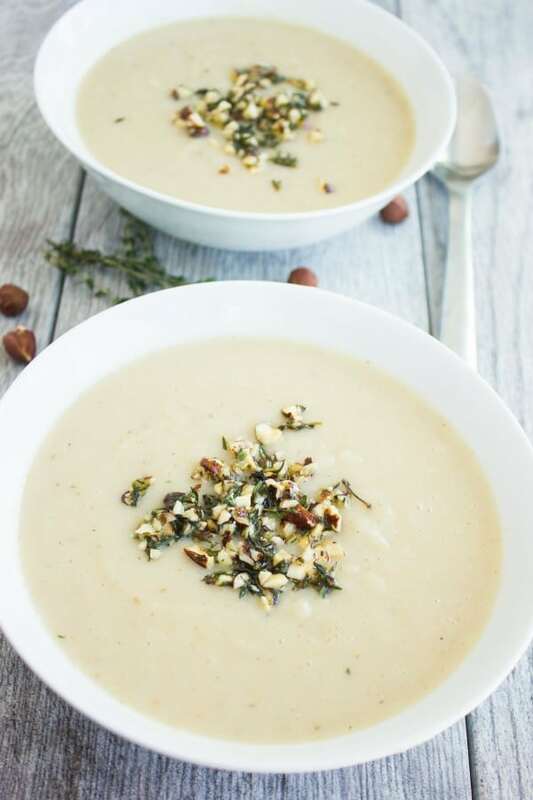 Top this Cauliflower Hazelnut Pear Soup with chopped hazelnuts and thyme for a slight crunch! Like many soup recipes, we start making this vegan cauliflower soup with sautéed onions, garlic and spices. 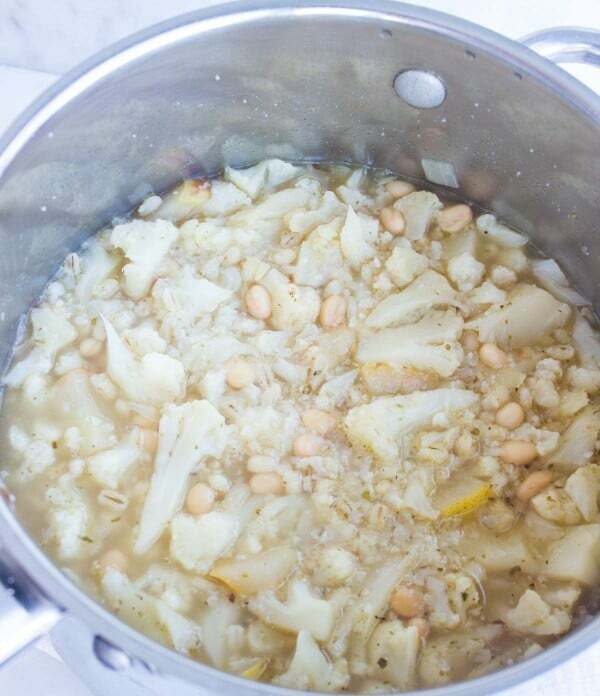 The cauliflower is added to the sautéd onions, followed by toasted hazelnuts, broth, oats and white navy beans. Let all ingredients simmer until the Cauliflower Hazelnut Pear Soup is done. I like to add just half a pear to the vegan cauliflower soup for a hint of sweetness and to balance out the flavors. 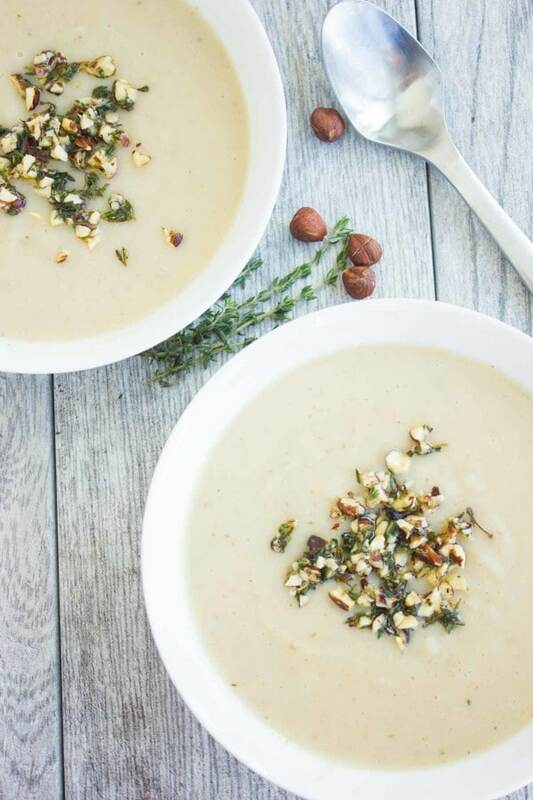 The Cauliflower Hazelnut Pear Soup is then blended (or left chunky if that’s your preference) and finished off with a crunchy toasted hazelnut, olive oil and herb topping making for a wonderful contrast of textures with every sip! Anytime you crave a luscious creamy soup (minus the cream! 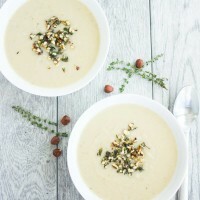 )—reach out for this Cauliflower Hazelnut Pear Soup and you won’t regret it! If you’re a cauliflower lover like me, you’ll have to make this Cauliflower Hazelnut Pear Soup right away! If you’re not, well next time you pass by the produce aisle and find a head of cauliflower looking at you, grab it and give this soup a try! Enjoy! For thickening this Cauliflower Hazelnut Pear Soup, I love using oats versus potatoes or flours. Primarily because it’s healthier and also because I prefer the oat-y flavor they lend to the soup. Navy beans or cannellini beans are further thickening agents of this vegan soup, giving it that smooth creamy texture without too many added calories. Usually, I also sprinkle some freshly grated Parmesan cheese on top. I am skipping it here to make this soup vegan and dairy free. 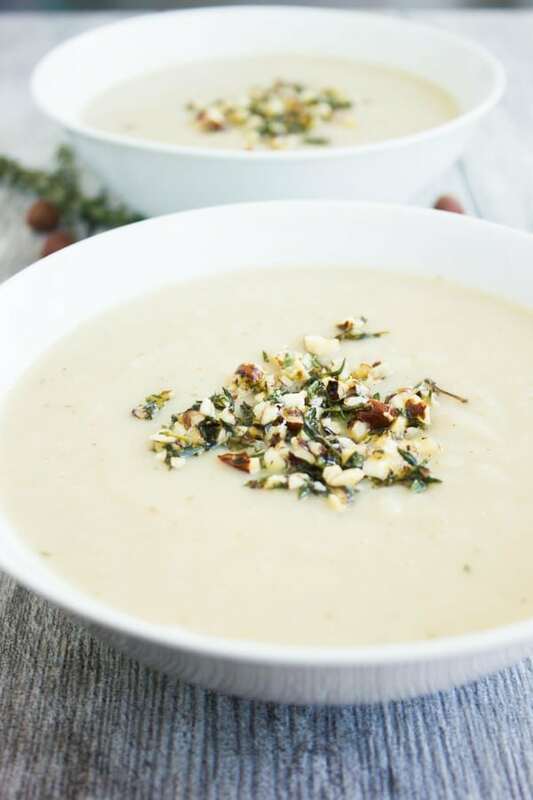 This vegan Cauliflower Hazelnut Pear Soup recipe is smooth, rich, satisfying and simply the best meal to cheer you up on a cold rainy day. The best thing? Even Cauliflower-haters will love this creamy, rich soup because it really does not taste that much of cauliflower. Heat a large pot over medium-high heat and add in the butter. As it starts to melt, add the onion and sauté with ¼ teaspoon of salt and 1 teaspoon of oregano. Lower the heat to medium and cook for about 2 minutes. Once the onion mixture is soft, add the garlic and sauté until opaque and fragrant, about another minute. Now add in the cauliflower, the remaining ½ teaspoon of oregano and sauté the mixture for just a minute. Season the cauliflower with a pinch of salt and pepper. Add the oats, hazelnuts, pear, beans and stock. Then bring the soup to a boil over high heat. At this point, lower the heat to medium-low and cook the soup until the cauliflower is tender. Puree the soup until creamy and smooth using an immersion blender Season with another ¼ teaspoon of salt (or to taste) and ¼ teaspoon of pepper (or to taste). In a small bowl, mix the hazelnuts and fresh herbs with the olive oil and red pepper flakes (if using). Serve the soup with a tablespoon of hazelnut herb crunch at the centre. Thank you Justin, it’s one of my favorite soups! Hope you try it out soon. I tried this soup for Easter and I love the colour, the texture and the taste!! I’m so glad you enjoyed this recipe Rasha, and your son too! :) You made my day! Hi Lara, Thanks for the compliment! oh my brother will love this I sure need to make this for him his favorite is hazelnut! What a delicious Cauliflower Hazelnut Pear Soup! I simply cannot wait to try it! Very interesting combination of ingredients. I am saving this recipe for later. What a beautiful and creamy soup! I love the combination of flavors and ingredients…it all comes together beautifully. What a great creamy soup!! I have a head of cauliflower in the fridge and I just asked Hubby what we should do with it. I love trying new recipes and I’ve never made this veggie in a soup or with a fruit. And another big plus pears are in season! WE often make a creamy cauliflower soup in the cold months but you’ve really elevated yours with the pear and hazelnuts. Perfect for fall! Oh how wonderful! I often make a cauliflower and hazelnut soup but ever added pears. I love the addition of fruit in there. Sounds so yum. What a stunningly elegant soup! Would be so good to serve company. This sounds absolutely amazing! I just need to find some pears and I’ll be set to make this dish for my family. Thank you.